In Samuel Bowles, Our New West (Hartford, Ct.: Hartford Pub. Co., 1869): 29. 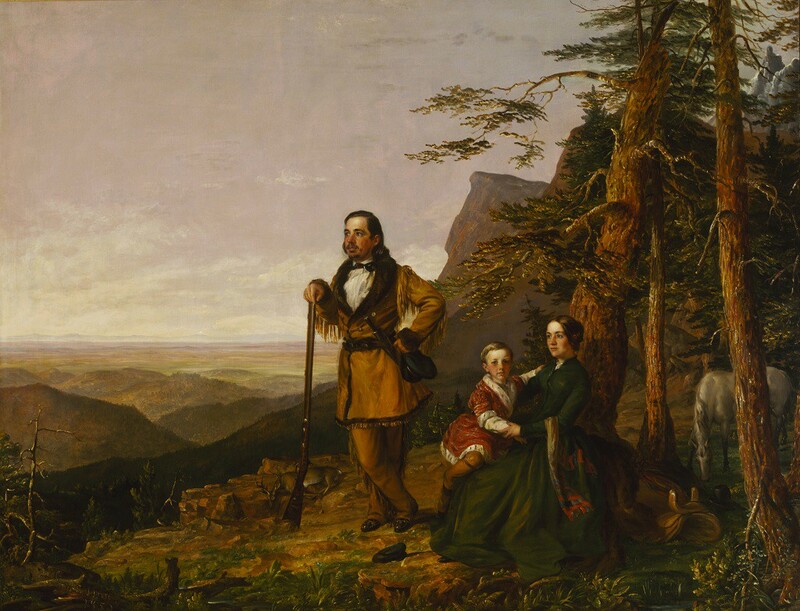 In this lesson students analyze a map, artworks, informational texts, and primary sources that present different perspectives on Manifest Destiny and the westward expansion of settlers and miners into U.S. territories during the nineteenth century. Students explore the experience of pioneers who faced challenges and hardships to build new lives in the West. They contrast this with the experience of Native Americans, who lost their lands and traditional ways of life as a result of westward expansion, and whose very survival was put in jeopardy. How did westward expansion impact the pioneers who were moving to the West? How did westward expansion impact the Native Americans who were already living in the West? 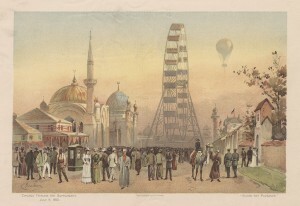 Westward expansion created a mix of hardships and opportunities for people. American pioneers and Native Americans experienced very different changes in their lives as a result of westward expansion. Students will integrate and evaluate content presented in diverse media and formats, including visually as well as in words. What area is shown on this map? What geographic features do you recognize? How would this map be useful to American migrants who were moving to the West? Read the paragraph below the map. What does this add to your understanding of the map? Does anything surprise you about this map? Explain. Hundreds of thousands of Native Americans lived in the area covered by the map. Does the map acknowledge their presence in any way? What does the map reveal about how non-Native Americans viewed the West? Explain that the author of this quote, John L. O’Sullivan, was the founder and editor of a Democratic political magazine. The quote appeared in an 1845 editorial written by O’Sullivan just after Texas became part of the United States. Ask students to restate the quote in their own words. Help them define unfamiliar words. Have students make a connection between the map and the quote: Explain that although Americans knew about the presence of the Indians in the West, they did not believe that Indians owned the land they lived on. Instead, Americans thought that the land was theirs to take. Ask students how the idea of Manifest Destiny could have influenced people who were thinking about moving to the West. 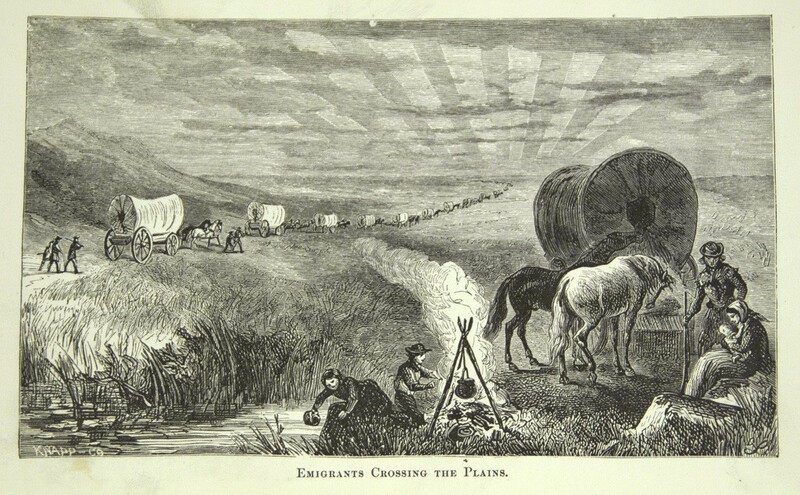 Introduce Emigrants Crossing the Plains and The Promised Land – The Grayson Family: Go over the terms background and foreground with the class. Then distribute copies of the Graphic Organizer: Compare Two Works of Art. 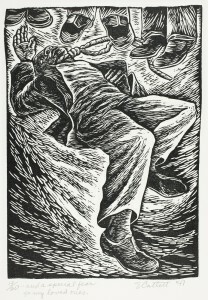 Project or distribute copies of the two artworks, Emigrants Crossing the Plains and The Promised Land – The Grayson Family. Have students work with partners or in small groups to look closely at both artworks and respond to the questions on the graphic organizer. What do you see in the background of each image? What do you see in the foreground of each image? What do you think the artists are communicating? What do these images tell us about why people moved to the West? What questions do you have about the artwork or artists? What do these images say about the experience of making the journey to the West? Complete this part of the lesson by asking students what other questions they have about each image. Have students read informational texts about the artworks: Divide students into an equal number of small groups. Give half of the groups copies of the Art Study: Emigrants Crossing the Plains, and the other half copies of the Art Study: The Promised Land – The Grayson Family. Tell students to work with their small groups to read the assigned text and then answer the questions at the end of the text. Then pair up groups that have read different texts. Have them share what they have learned with each other. Afterward, recap what students have learned about each image from the informational text. Ask: How have the texts deepened your understanding of the images? Have students respond to a writing prompt: Project the two images again. Point out that in The Promised Land – The Grayson Family, the family has arrived at their destination, but in Emigrants Crossing the Plains, the pioneers are still making the journey. Tell students to use information from the art and the texts to write a short response to this prompt: What do you think these families were thinking and feeling about their migration to the West? What might have drawn them to the West? You may want to have students talk with a partner before writing. Afterward, invite volunteers to read their responses to the whole class. What details in the text conveyed what the family members were thinking and feeling as they approached California? Compare your response to the writing prompt with what you read in the excerpt. How does the description in the text of their arrival compare to the scene in the painting of Andrew Jackson Grayson and his family? Support your answer with details from the text and the painting. Introduce the African American “Exodusters” with a primary source : Tell students that after the Civil War, African Americans began leaving the South in large numbers because of the harsh living conditions, lack of opportunity, and racial discrimination. While many went to cities in the North, others ventured west. African American families who went west to Kansas and Oklahoma became known as Exodusters. Who are the people who have issued this broadside? Where are they from and where are they going? What is the “Colony”? How can people join the Colony? How will the Colony be organized? What factors do you think would motivate people to move from Kentucky to Kansas? What do you notice about the buildings in this photograph? What do you notice about the landscape in the background? How are the people in the image dressed? What else do you notice about them? Do you think this is a normal day or a special occasion? Why? What else did the photographer include in this picture? Why do you think he or she would include these things? What are your impressions of the town of Nicodemus? What challenges do you think the people of Nicodemus might have faced? What other questions do you have about this photograph? Explain that Satanta was a leader of the Kiowa people who lived in the Great Plains. Show the students this area on the Map: Territory of the United States, c. 1865-1868 (AACL URL needed). Satanta was called the “Orator of the Plains” in American newspapers, and he fought against westward expansion. He was worried that the railroads would disrupt the buffalo herds, which were very important to the survival of his tribe. 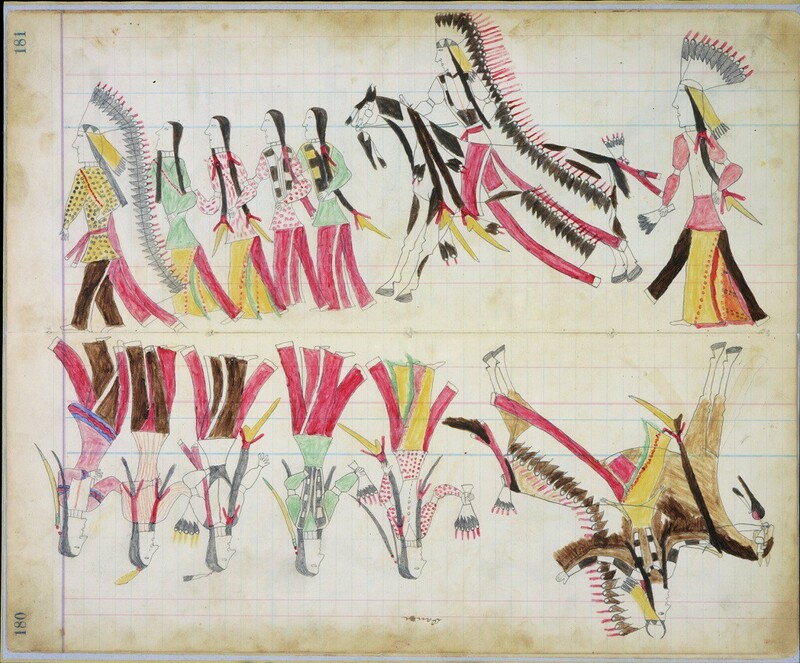 Ask students to describe Satanta’s perspective on the arrival of soldiers and settlers. How is it different from other artworks we’ve looked at? How is it similar? The materials used to create this artwork (pencil, paper) differ from the materials used to create the painting and the print. The way that each artist learned to make art might have differed. The artists may have held different cultural ideas of what art is supposed to look like. Have students read an informational text about the artwork: Distribute copies of the Art Study: Black Horse Ledger. Have students work with partners or in small groups to read the text and answer the questions that follow it. Afterward, discuss students’ responses to the questions. Ask them what the text has added to their understanding of the artwork. What is happening in these two scenes? What details help depict the action? The caption on page 6 of the ledger reads, “Soldiers Charging at Powder River.” The caption on page 7 reads, “Soldier pursued.” What additional information do you learn from these captions? 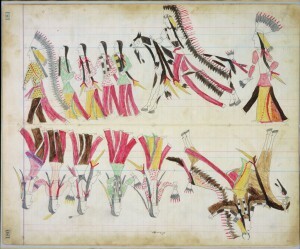 How is this drawing different from the other ledger drawing that you studied? What does it reveal about the relationship between the Cheyenne and the U.S. government? How does Chief Joseph describe the early relationship between white settlers and the Nez Perce? What passages in the text support your answer? How did the relationship change? What changed it, according to Chief Joseph? Based on the information in this article, how were the Nez Perce affected by the western expansion of white Americans? What do these different sources tell us about life in the West? What do they not tell us? How did westward expansion affect people moving to the West? How did westward expansion affect the people already living in the West? Ask students to keep these ideas in mind as they work on the independent writing project. Role: The writing should be from the point of view of a specific character who has experienced the effects of westward expansion. Topic: The writing should focus on a particular topic related to westward expansion. Go through a few examples on the organizer. Students should brainstorm their own ideas about the role, audience, format, and topic in the blank row at the bottom of the page. Go through the RAFT Rubric so that students will understand the expectations. Tell students that after they have determined a role, audience, format, and topic, they should plan their writing further by asking and answering questions on the RAFT Writing Planner. Provide time for students to independently review the map, the works of art, the document set, and the other primary sources. Instruct students to use details from these sources in their writing. You may wish to have them conduct additional research on the experiences of pioneers and Native Americans during the period of westward expansion. Then have students write their texts in class or as homework. Share students’ writing with the class: Have students present their final written work to their classmates by displaying it or reading it aloud. Invite the class to respond to their classmates’ writing orally or in a journal, reflecting on what they’ve learned about the effects of westward expansion on those who went west and on Native Americans. Domnauer, Teresa. Westward Expansion (A True Book). New York: Scholastic Inc., 2010. Musolf, Nell. The Split History of Westward Expansion in the United States (A Perspectives Flip Book). North Mankato, Minnesota: Compass Point Books, 2013. Roza, Greg. Westward Expansion (The Story of America Series). 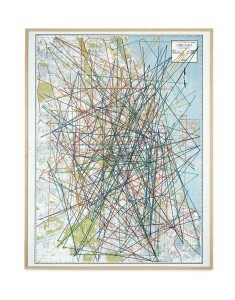 New York: Gareth Stevens Publishing, 2011.